I have to admit that there are days where I desperately miss greasy, gooey, horribly bad for you pizza. It wasn't so bad in Boston because Zing's pizza in Porter Square came out with a gluten free pizza shortly after I found out about my allergy. This pizza was AMAZING not only for the gluten free aspect but all the ingredients were locally grown. If you live nearby and haven't tried them yet you need to go... like right now. Since moving I haven't found a restaurant that has gluten free pizza but I did find a frozen alternative. These are my second favorite gluten free pizza crusts. My friend Evie found a gluten free crust at Whole Foods which is my favorite but we don't live near a Whole Foods so I usually eat these. 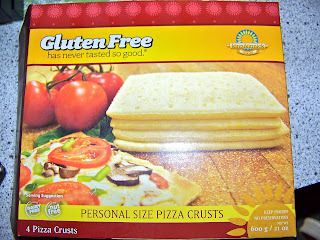 They are personal size frozen pizza crusts from Kinnikinnick Foods Inc. They are a little sweeter than your average pizza crust but they are much thicker and more dough like than your average gluten free crust. I actually really like the slightly sweeter taste to them and for me, they are the perfect size. I find I like the crust a lot more if I cook the pizza a few minutes longer than recommended. I also seem to always decide I want pizza when we are out of sauce so I take some inspiration from Zing and get a little creative with my toppings. 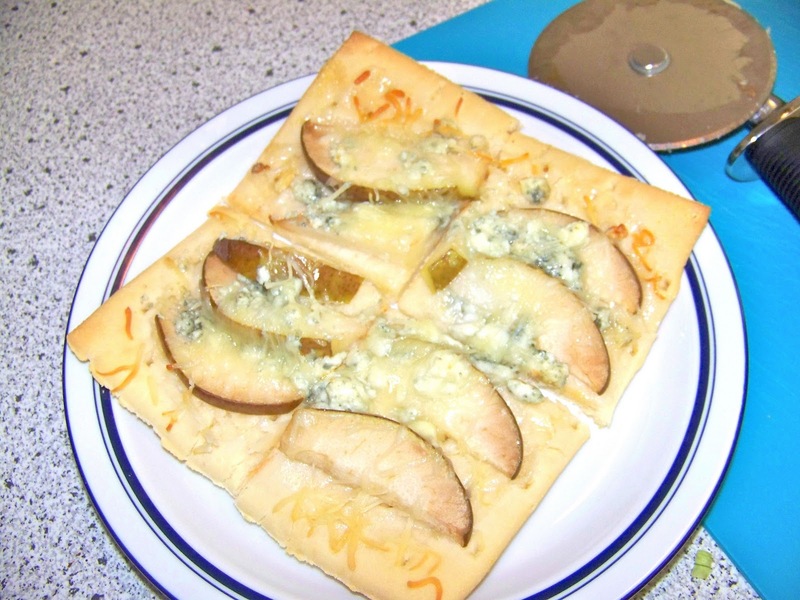 The pizza shown below is topped with pear, blue cheese, a little mozzarella, baked and then drizzled with honey. Another favorite is spreading the crust with cream cheese and then topping with turkey lunch meat and a little bit of blue cheese. After backing I add some tabasco sauce. I've even topped it with some scrambled eggs, crumbled bacon and mushrooms with american cheese and then after backing add some tabasco sauce.